Work with Patience to reach your destiny of success. The highway to success requires a hard working and patient person. You have to carry on walking towards your mission until you succeed despite the challenges you meet on the highway to success. Patience helps in building your determination to succeed in life. But you should always remember that “Patience is bitter, but its fruit is sweet.” It therefore pays to be patient. 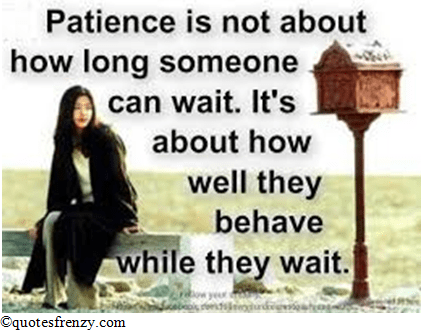 Patience is required everywhere at home, in the office, with friends and in public life. It is a quality which many successful people have exploited to the very maximum. To patient people failing is a learning process and not a disaster. Patience a key to success as success does come overnight.